Look at your current situation in life. Do you like it? Did you choose it? Do you wish it were different? Ammon was presenting to our Toasmasters club. I don’t know if his speech was designed to be controversial, of if it just turned out that way. See, Ammon believed that the you, me, him, we all DID choose our situation in life. By being in a situation and refusing to change it, we have by our decisions, chosen our lot in life. It’s an interesting idea, and one that I’m not sure he completely thought through. Later in his speech he quoted a concentration camp survivor. He explained how the man kept a positive attitude during a period of hell on earth. Ammon, do you think the concerntation camp prisoner liked his situation? I’m unclear how that matches your earlier statement that we are responsible for our situation in life? Oh, maybe I shoudl have thought about that more. Still, I enjoyed your speech. Notwithstanding, Ammon’s contradiction, I agree with his premise. We all have tremendous control over our situation, even if it’s only in controlling how to approach the day. I spent the last several months restoring my car. 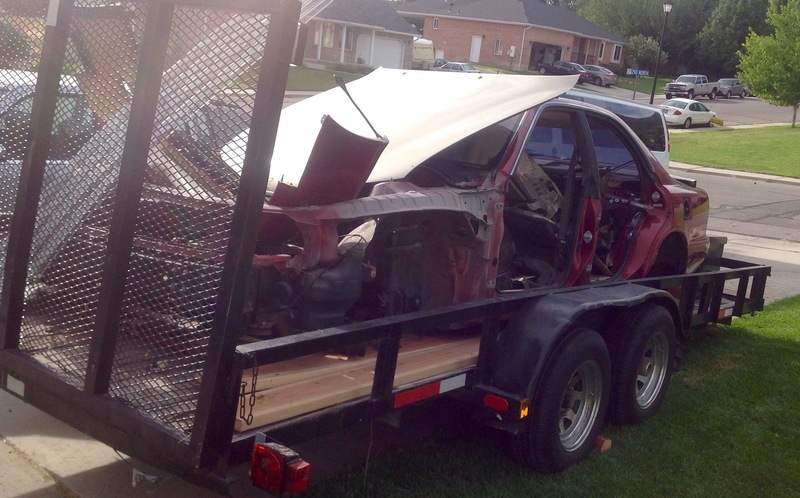 The shell of our “parts” car has been cluttering up my driveway. I had salvaged almost all the parts I wanted. My car still has a steering issue, and I wanted to get the rack from the spare car before we haul it off the metal recycler. However, a couple weeks ago, my neighbor and his sons showed up to help load the Red Lexus onto a trailer. I couldn’t do this on my own, so I when the help was available I took advantage of it. I was getting ready to head out of town. If you want to haul the trailer off while I’m gone, feel free. I’ve taken everything I want from the red car. What about the rack? It’s still attached. I looked at the car sitting on the trailer. I have everything I really want. If I really wanted that rack, I would have taken it off by now. No, I’m good. I can’t say that I’m perfect at being able to live without regrets, but I’m working on it. If I’d even written a tenth of what you write, I’d have a well established blog. Why did I do it and he, who is (although I’ll never admit it) just as good a writer as me, didn’t? Simple. I wanted to be a blogger and he didn’t. I wish I could play the piano like you do. Why did it make him mad Because they were lying. Maybe they were even lying to themselves. But, did they really wish they had spent hours and hours practicing every day? No. They didn’t really want to be a piano player. A few people want to be writers. Most want to have written. In other words, they don’t want to go through the writing process. Instead, like my piano playing friend’s fans, they want the results without the work. Most people typically get to do exactly what they want. Think about your own situation? Do you wish you were a writer and yet your best work is done on facebook and Twitter? Do you really want to be in better shape, but would rather sleep in than get up and run in the rain? Do you hate your job, but keep showing up every morning because you don’t want to go through the pain of changing jobs? I own a guitar. I can play one chord and no songs on it. I don’t want to be a musician enough to put it ahead of other interests. I have friends who are brilliant musicians. They don’t write. They don’t have 13 kids. They don’t tinker with cars on the weekends. Each of us are a little like the concentration camp prisoner. We do not have 100% control over our situations. But, are we really stopped by circumstances? Or are we limited by our own fear of failure? Or our fear of change?